I ripped off a taxi cabdriver in Mexico. But I didn’t mean to. I promise. I was out in Nogales, Sonora, reporting on a story about immigrants illegally crossing the border from Mexico into the United States. For the first time in a while, I didn’t rely on my iPhone’s Google maps for directions. 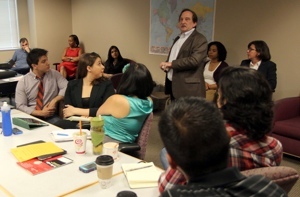 I navigated the border city by asking pedestrians in Spanish how to get to migrant shelters. 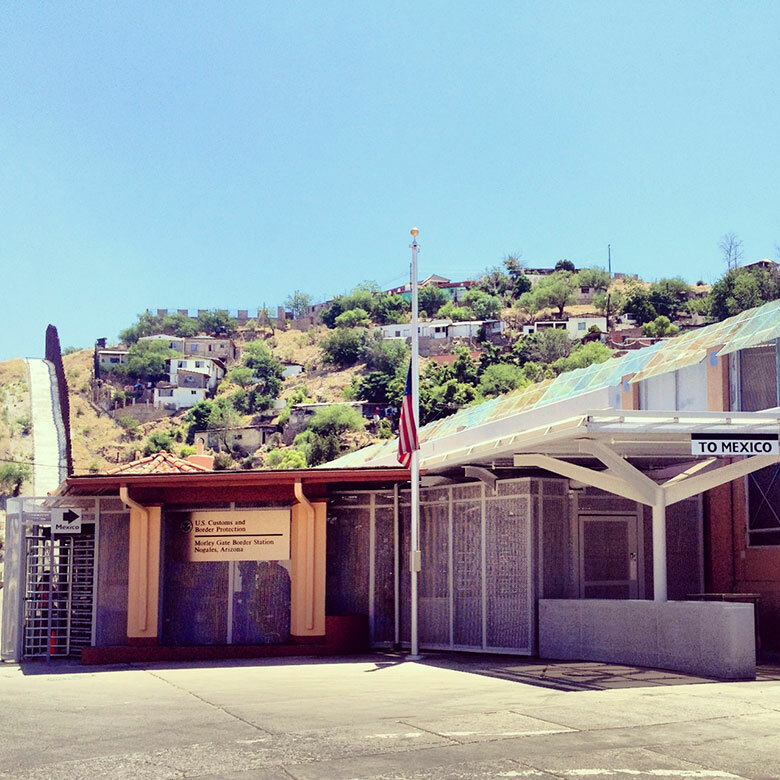 After easily crossing from Nogales, Ariz., to Nogales, Sonora, through the Morley Gate Border Station (it’s not as easy to cross back from Mexico to the United States), I asked a woman how to get to Iglesia Nuestra Senora de Guadalupe. She pointed to where I would catch a bus. I hopped on the bus pretending I knew exactly where I was going. I wasn’t prepared to pay with pesos so I asked the bus driver if I could pay with dollars. He nodded yes. Another woman sitting inside the bus got off at the same stop I did. We walked together across train tracks and I asked her for directions to the church. 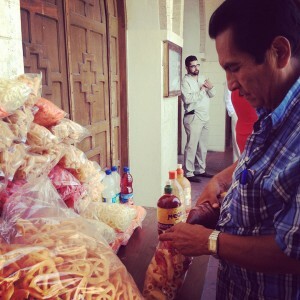 I walked uphill until reaching the front steps of the church, where I met Don Ramon Garcia. He sells chicharrones, or crunchy pork skins, kind of like chips. I got so excited to eat something Mexican that I asked him to prepare me a bag of chicharrones with lemon and spicy red hot sauce. They were so good. From there, Don Ramon gave me directions to my next destination: San Juan Bosco, a shelter for migrants who have either been deported or are transients – on their way to the United States. “Walk straight for about four blocks, then turn right until you reach a hieleria,” or a store that sells ice, Don Ramon said. On my walk to the hieleria, I met Abel Palma, the taxi cabdriver. I ask him how far the hieleria was and he said it was a drive away. I asked him for a ride to San Juan Bosco and so our conversation began. Abel lived in Los Angeles for about eight years before getting deported to Mexico. We talked in Spanish until he surprised me when he shifted to English. “The American dream ended for me,” Abel said. “But at least I speak a little English,” he said with a chuckle. He met his wife in Sonora and they have three kids. Abel said he lives a happy and more relaxed life in Sonora, compared to when he lived in California. Plus, he said, his English helps him get pretty good tips from tourists he gives rides to. He was so nice to wait for me after I knocked at the front door of San Juan Bosco to find that the shelter’s directors were not there and the migrants were at the Kino Border Initiative center for lunch. Abel then gave me a ride to Kino, a feeding center mostly for immigrants who were deported. I knew I would be there longer after I met Sister Alma Delia Isais Aguilar, a volunteer, and Enrique Palacios, a 19-year-old from Tlaxcala, Mexico, who was deported from Arizona. I took down Abel’s phone number and saved it on my cell to call him, after my interviews, for a ride back to the port of entry. I asked him how the taxi fare was. I never called him because my phone died. But I got lucky because Father Ricardo Machuca, who directs the Kino center, offered me a ride to the other side of the border. After about 30 minutes stuck waiting in line behind other cars trying to cross, we made it to the other side. Father Ricardo dropped me off at the Shell gas station from where I could see the steel fence, about 23 feet high, separating the twin cities of Nogales, Arizona, and Nogales, Sonora. Inside the Shell gas station’s store I charged my iPhone. After about 30 minutes I called Abel. I couldn’t make it back Monday. I think I’m going to call him again. Contact Griselda Ramirez about this story. Griselda, y hope the taxi driver does not have a bad perspective of all the US reporters now, ha ha ha…. I enjoy this story which in reality is was a great adventure for you, be safe out there and thank you for personal story. P.S. Do pay the taxi driver soon, LOL.